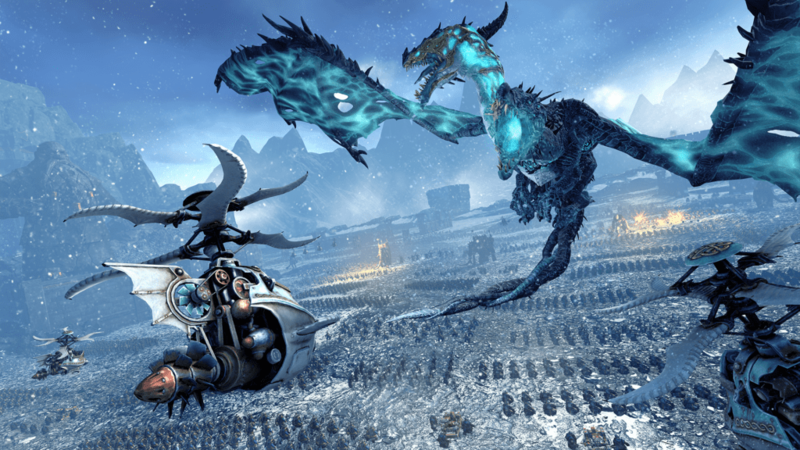 How do Lords work in Total War: WARHAMMER? We shook up the standard Total War formula of Agents and Generals, and wove characters more deeply into campaign and battle. There’s also a shedload of customisation options for them, including deeper skill trees, and a mix of common and legendary weapons, armour, items and mounts to equip them with. Characters essentially come in three flavours. The first type is Lords, and these guys can perform a number of roles in your campaign. They can be employed as Generals, which in many ways work like generals in other TW games; they lead armies around the campaign map and in battle, inspiring and bolstering troop morale. Every army requires a general in order to deploy on and move around the Campaign Map. Unlike the generals of previous TW games, they’re considerably more combat orientated and can be either melee or magic focussed. Wizard Lords have access to a magical lore specific to their race, and draw on the Winds of Magic to cast their spells. Melee Lords are hardier and more powerful fighters and you’ll want to make use of that prowess in battle. There are also some Lords that operate like hybrids of the two, exhibiting strengths in both melee and magic. Lords can also be placed into other roles as well. For example, as Admirals they’ll lead your fleets around the oceans (though all naval engagements will be auto-resolved, as given how land battle-focused Warhammer is, we’ve concentrated on those). You might also appoint a Lord as an Overseer. They are then assigned a province to govern, reacting to challenges by handing down commandments to direct the efforts of the populace, and through the application of their own skills. Should the provincial capital be attacked, the Overseer will personally lead the garrison troops in their efforts to defend the walls. Though garrisons in general will be better equipped to deal with enemy forces regardless. The second character type is Heroes. Like the agents in previous Total War games, they perform a variety of strategic functions on the campaign map, such as assassination, sabotage and so forth, but when attached to armies, they now appear in any battle as a standalone unit. Like Lords, they can be melee or magic focussed, and in some rare cases, such as the Empire Warrior Priest, be a hybrid of the two. But the crucial point here is that they now get stuck in and actually fight, and bring to bear all the skills, abilities and items you grant them as they level up. The third character type is Legendary Lords. Now these are the big guys, the named characters from Warhammer Lore, and the paragons of their races. Your chosen Legendary Lord acts as a general, and is a remarkable warrior in his own right. 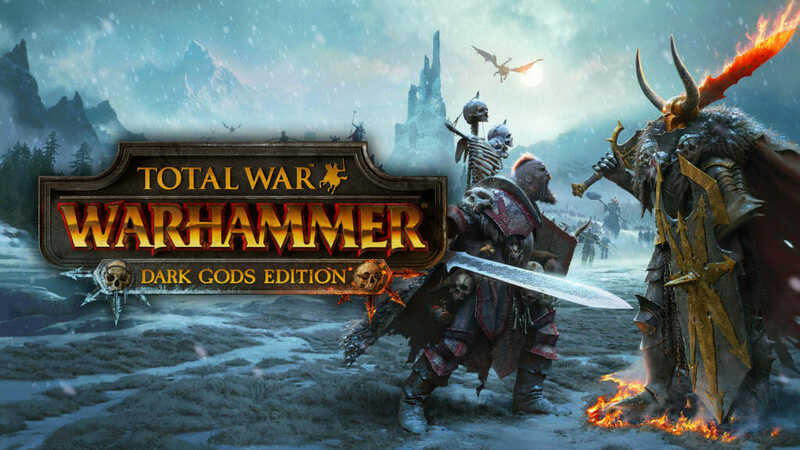 The big difference with Legendary Lords over Lords is that alongside the standard Strategic, Tactical and Battle skills branches, they also have a Unique Skills branch to their skill tree that is completely personal to them, and this is where a good deal of the narrative in Total War: WARHAMMER stems from. So, for example, when Ungrim Ironfist levels up, you get an allocation of skill points to spend in any of his branches. Spend them in the Unique Skills branch, and you’ll begin to unlock quests that are unique to Ungrim. These quests take you through a series of tasks and battles, and culminate in Quest Battles. The reward is one of the legendary magic items only Ungrim has access to in the tabletop game. These items are bound to the Legendary Lords and can never be lost, though if that character has a choice of items, you can equip him as you see fit. 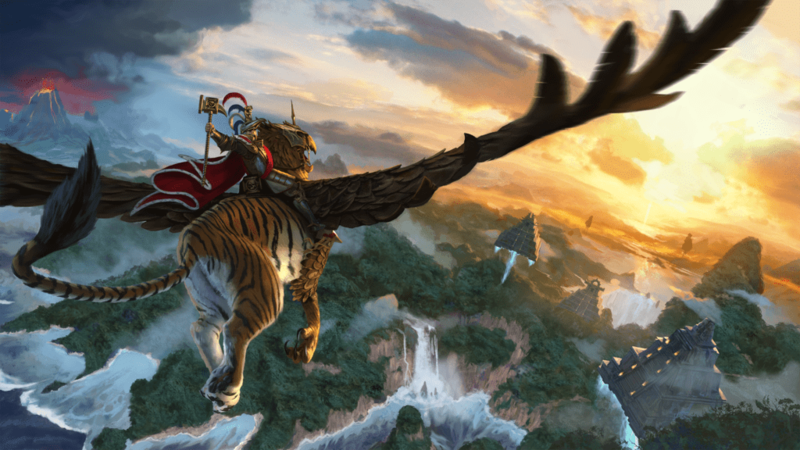 In fact, all character types can be equipped with up to six magic items, including armour, weapons, enchanted items, arcane items, and talismans, many of which are familiar to Warhammer players as they’re right out of the rulebooks. These items are earned as rewards for victory in battle, and in some cases, even stolen from defeated lords (look out for skills that increase the chance of your character being a thieving git). Given that so much of the lore and backstory of Warhammer Fantasy Battles stems from its characters, we really wanted to do them justice and Ungrim’s a great example. To say he’s a conflicted character is something of an understatement. As the Slayer King, his two roles are at odds; while he’s charged with the success and wellbeing of his people, he’s also oath-bound to seek the biggest, meanest monster he can clap eyes on, and die while engaged in glorious battle against it. As you might imagine, this conflict tears at him, and through his unique skills tree, along with the all the quests, quest-battles and legendary items it generates, we really dig deep into his character and his story. 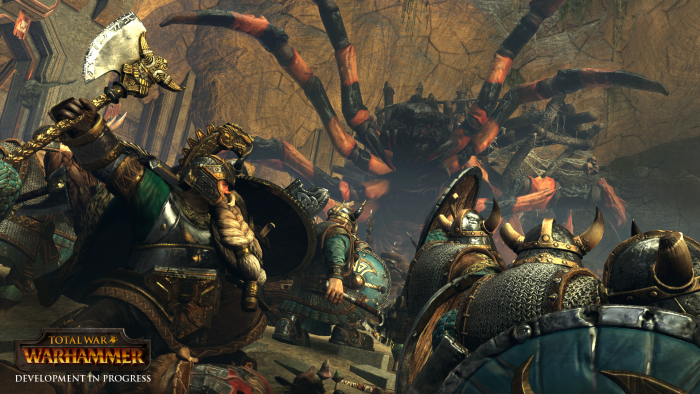 In the first game, each playable race come with a choice of two Legendary Lords to start a campaign with – for example the Dwarfs get Thorgrim Grudgebearer or Ungrim Ironfist. The Legendary Lord you choose to lead your Campaign can make a big difference to your strategy, as each brings a series of unique benefits that might positively (or negatively) influence the units you recruit, the tactics you employ and the forces you deploy. A Dwarfen campaign under Ungrim, could have quite a different attitude to one under Thorgrim. However, any other Legendary Lords in your race, including the ‘official‘ race leaders (who are always around to engage in diplomacy) will join in your campaign later, even if you don’t choose them to lead your efforts initially. Characters, and units, that join battle mounted will remain so; they won’t be able to dismount during the fight. In the game there is the opportunity to unlock/earn/steal Magic Banners for your armies. However, it’s worth pointing out that these are indicated in battle through a gloriously (or disgustingly, depending on your race) embellished banner indicator above the unit who has it equipped. Worth pointing out that you don’t always need to have troops in your army. Because Lords are so mighty, and can have Heroes and other Lords join them on the campaign map, you could build a party of adventurers rather than an army.